what we’ve been up to. | everything will turn out alright. sylvie had a pediatrician appointment this morning. 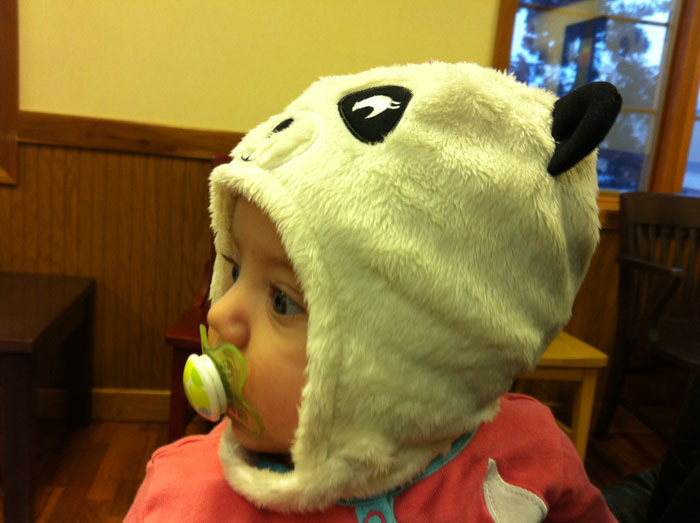 she wore her favorite panda hat for the occasion. (thanks aunt marsha!) we found out she weighs 14 pounds 11 ounces (that’s almost a pound and a half gained since christmas eve!) and it still holding tight at 25 inches long. developmentally she is doing fantastic. 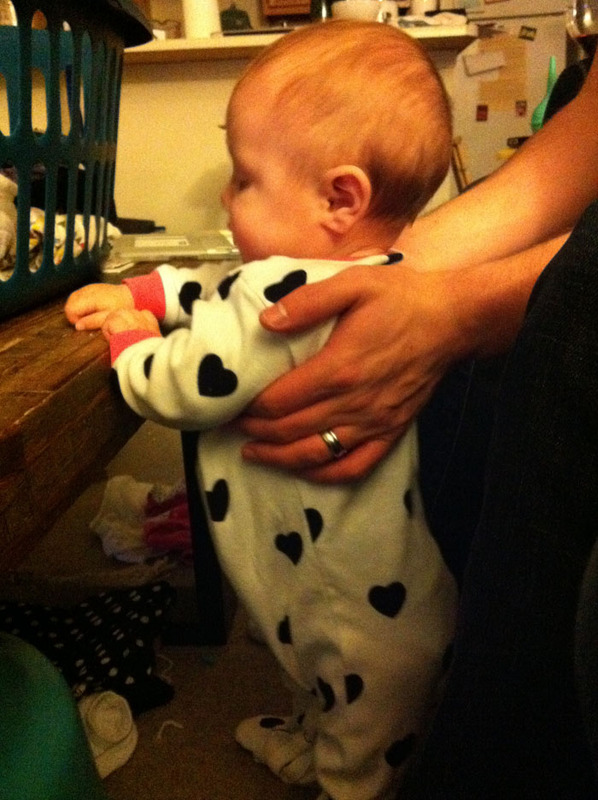 she can bear weight on her legs, sit unsupported for minutes at a time, and has become a pro at mimicking us. the only area in which she is falling behind is tummy time. ever since she learned how to roll from front to back she has avoided tummy time with all of her might. i think we may have figured out a solution. this is either parenting at its worst or its finest. whatever. she did tummy time for a full 10 minutes without whining or trying to roll over. it’s a new record! i don’t blame her for her aversion to tummy time. why would she want to lay down when she can STAND? this is blowing my mind right about now! she can STAND with very little support. when in the heck-fire did this happen?! also, i have a confession to make. with all of the traveling we’ve done lately, we have gotten a little lax with cloth diapering. however, i am happy to report that we’ve started it again! this afternoon’s diaper even matches her outfit. 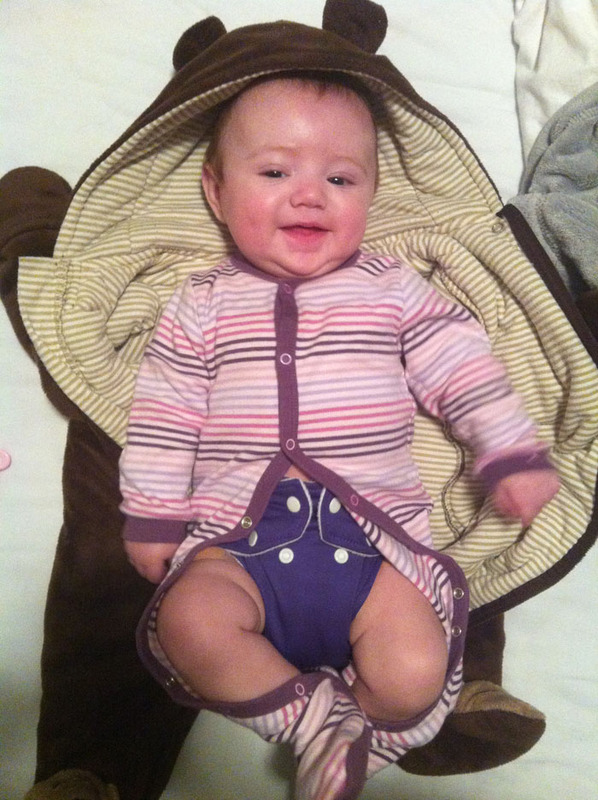 cloth diapers are great for the environment, friendlier to the tush, and blah blah blah. whatever. they’re stinkin’ CUTE. end of story. you know what else is stinkin’ CUTE? 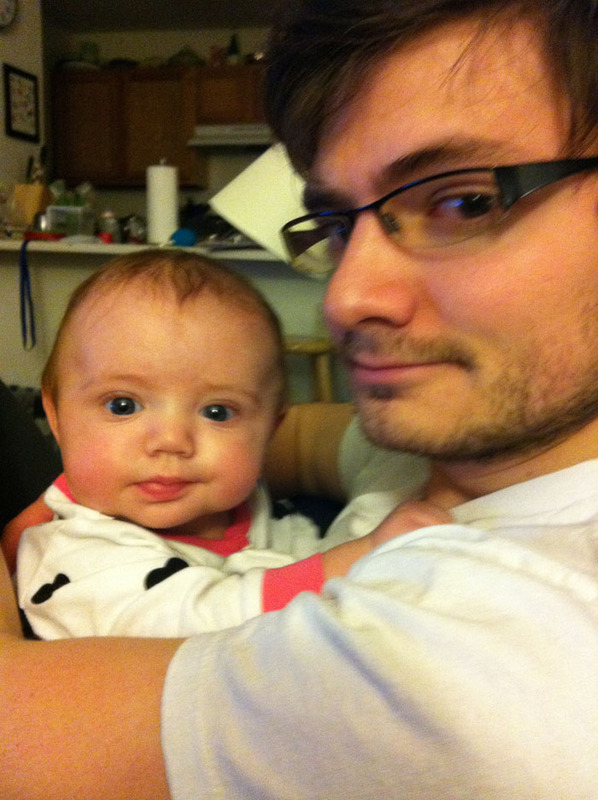 sylvie does this thing where she puts one finger in her mouth and then looks at me or travis all sweet and dimply. yeah. it slays me, too. she is getting funnier and more fun every single day. this month is shaping up to be the best one yet! This entry was posted in Uncategorized and tagged 5 months. Bookmark the permalink. Genius Baby. That’s just all there is to it! WOW! So much progression! She is amazing. I can’t believe she can stand! And that face with the finger in her mouth is just too darn cute for words. Haha, I laughed out loud when I saw the laptop! You gotta do what you gotta do! Yep! I felt a little guilty for about 2 seconds. Then I realized it was ridiculously cute! 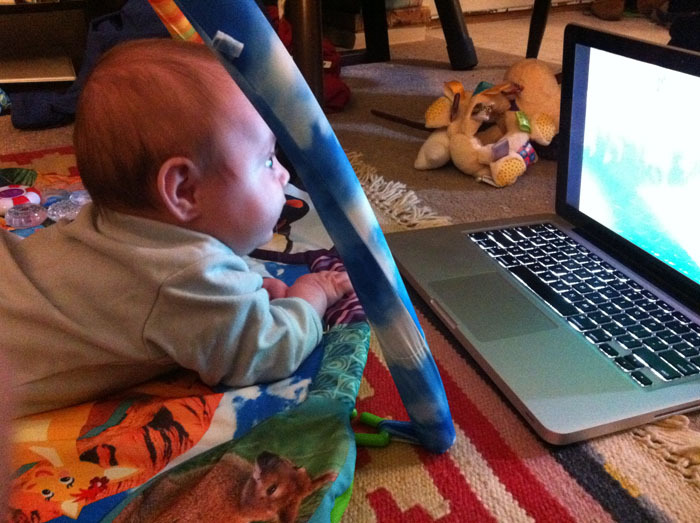 And I love your tummy time solution. 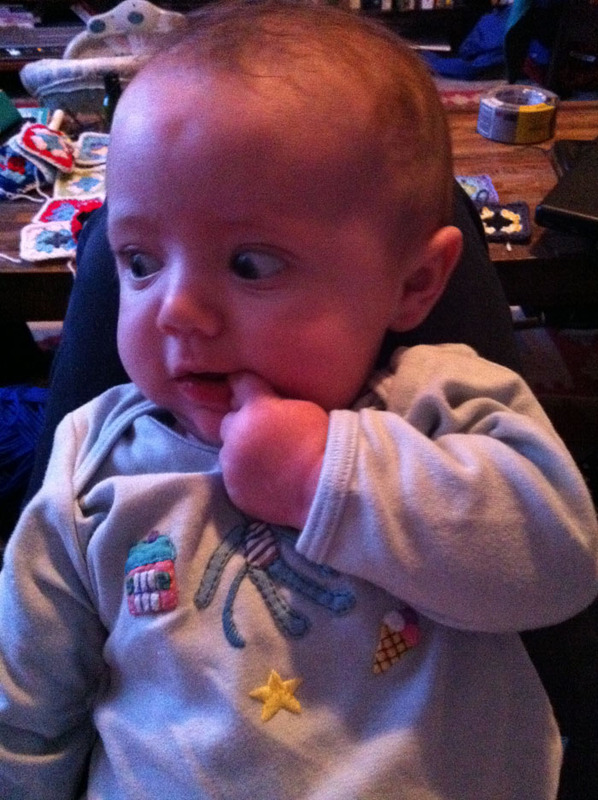 Perhaps if you put on Baby Mozart, it won’t be so bad?! Haha. As if. Oh well, at least she’ll do it now! And I can’t believe she can STAND! Well we don’t have any Baby Mozart, but it was classic Looney Tunes. We call it “Tummy Time with Bugs and Daffy” now. Seriously, I can’t believe she can stand either! She’s always had really strong legs, but it still blew me away. So cute! And I think she looks just like you in the pic where you’re showing her diaper! Thanks so much Alisha! 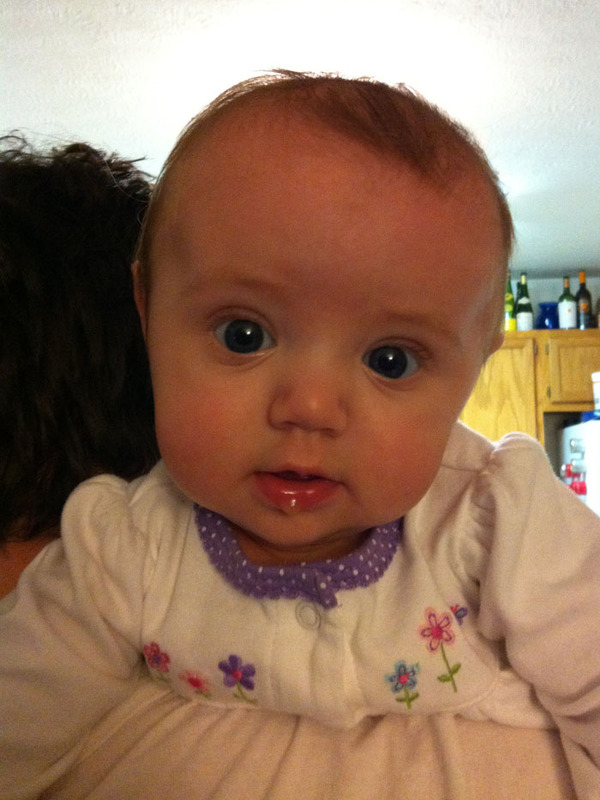 I think she looks just like Trav in the pic where he’s holding her. She does look like him in that pic! 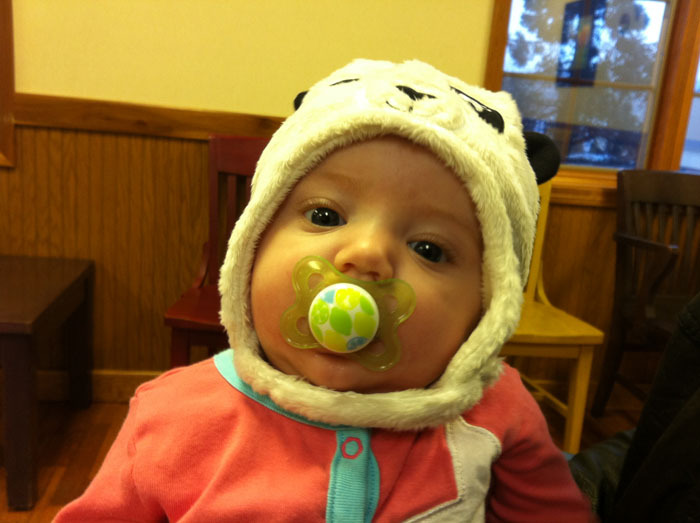 She looks great in her new panda hat! Does she use a Mac or PC ? We’re a Mac family, Nancy! Cute, cute, CUTE!! What a doll. 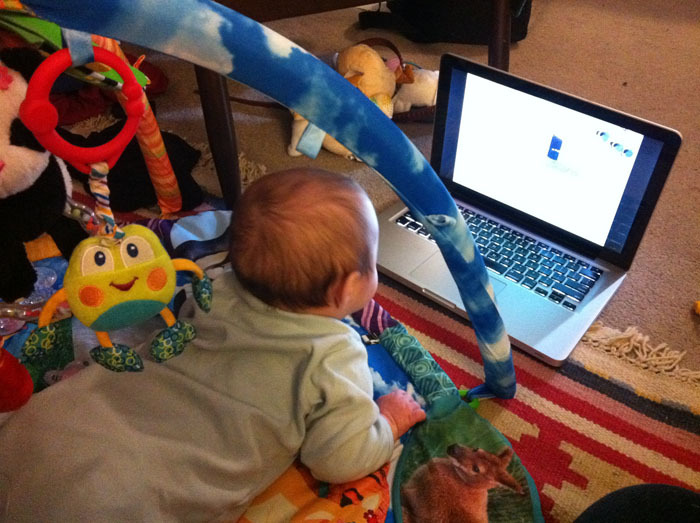 Oliver doesn’t like tummy time either…but he does like to watch the electronic screens…I like it! Clever clever. I love our cloth diapers, but actually I like him in a disposable sometimes because I can feel his body curl around me more for snuggling. Sometimes the cloth are just so bulky. Also, mine seem to wick moisture onto his clothes. I dunno. One of those things you have to figure out. Thanks Kristin! I don’t think I know a single baby who actually likes tummy time. We keep Sylvie in a disposable overnight b/c she sleeps so much better. I don’t have any advice for moisture wicking onto clothes. I’ve never heard of that happening! Weird!